Controlling a classroom of students is difficult enough without having any additional factors working against you. One of the key factors in keeping children attentive is to ensure that they are engaged and stimulated by what you are teaching them. An interested student is likely to be a well behaved student and for this reason it is crucial that their vision is as good as it could be. Young children: Young children who have problems with their vision are often completely unaware that this is the case. 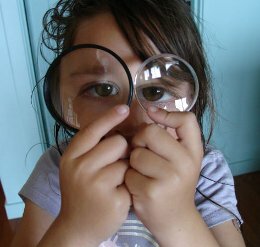 Young children tend to assume they are normal and if their vision has been blurred all their life, they will never have known anything different. In addition to this, if they have one good eye and one lazy eye, they are very unlikely to be aware of their lazy eye as there good eye will always take control. Older children: Some older children are also completely unaware if they have visual problems and this is especially the case if it just affects one eye. A more common scenario however is that older children are fully aware that they have blurred vision but do not want anyone to know (including the teacher) as they fear they will have to wear glasses. Although the style of glasses has improved in recent years, most children still feel self-conscious about the thought of wearing them and hence try to hide the fact that they have problems with their vision. Disruptive behaviour: Naturally there are a whole host of reasons a child could be disruptive and as their teacher you are as likely to be aware of these as anyone. It is however quite common for a child to become disruptive in a classroom if they cannot fully engage and blurred vision is a possible reason for this. Dislike of playing sports: If you have a student who is extremely reluctant to take part in sports classes, then there is a good chance they may have a lazy eye. In order to play most sports, it is crucial that both eyes are equally strong and work together. Hand eye co-ordination is crucial to most sports and a child with a lazy eye is likely to be hampered in this respect. In order to have good hand eye co-ordination it is critical that you have good stereopsis (depth perception) and if a child has a lazy eye then this is likely to be significantly impaired. As such, children with a lazy eye are likely to find sports extremely difficult and hence try to avoid them at all costs to avoid embarrassment. Squinting their eye lids together: By doing this a student is able to reduce their blurred vision and it is likely to indicate short sightedness. Short sightedness is very common and is easily corrected by either glasses or contact lenses. If a child is short sighted they will have problems with distance vision tasks such as seeing the projector chart. This could lead to disruptive behaviour as the child is not fully able to engage in learning. Slow reading: If a child is not progressing with their reading as well as you think they should then their vision could be a possible cause. There is obviously natural variation in the abilities of children but being long sighted can put a child at an extra disadvantage for reading development. Long sightedness effectively means that when a child is reading, their eyes are under extra strain and consequently go in and out of focus. It also makes reading over a long period of time more tiring and eye strain is likely to occur. Headaches: Children will often complain of headaches and it can be difficult for teachers to gauge just how genuine they are. Kids do after all like to ‘try it on’ now and again and it is a teacher’s job to figure out when this is the case! If one of your students consistently complains of a frontal headache (forehead) which seems worse after reading or computer use, then there is a high probability that it is related to their eyes. Such children are likely to be long sighted or have astigmatism, both of which are easily corrected with glasses. If you recognise any of the above signs in any of your students then the best thing to do is to contact their parents and recommend they go for an eye test. You may sometimes find resistance from parents who will claim ‘there is nothing wrong with their child’s vision’ as they see it as some sort of parental failure that they haven’t already picked it up. Defuse the situation by explaining to parents that this often happens and the most common place visual problems are picked up is in the classroom. If one of your students is found to need glasses or contact lenses you may find a significant improvement in both their behaviour and academic achievements going forward. This article was written by experienced Optometrist Tim Harwood who is currently based in the UK. Tim has had many parents bringing their children in for eye tests that have been having problems at school and found that they need glasses. Giving them the best possible vision has regularly resulted in their performance at school improving. For older children who refuse to wear glasses, contact lenses are an excellent alternative. How To Know If Any Of Your Students Need Glasses was posted in Learning, Teaching and Education, Teaching for Teachers by Guest Author.